This was actually kind of easy. I only read three books this month, so I didn’t have much to choose from, but my favorite was hands down Pandemonium by Lauren Oliver, the second book in her Delirium trilogy. I won’t write much about it because it only gives away the first book (which you should read), but just know it’s just as action packed as the first (if not more), and Lena, the main character, is so compelling and strong, it’s crazy. She’s a great heroine, and I can’t see what happens to her next. But what I found most relevant about it is that, especially right now with a conservative fight going on politically, I can almost see the country going “yes, i agree, we should get rid of love! It’s a disease!” Crazy, right? Anyway, that’s the best book I read in March. I wasn’t that bowled over by DELIRIUM, but from what I’ve heard about PANDEMONIUM, it’s supposedly faster paced? I found myself questioning a lot of things in the first book–though I did enjoy it, I didn’t like it as much as I thought I would. 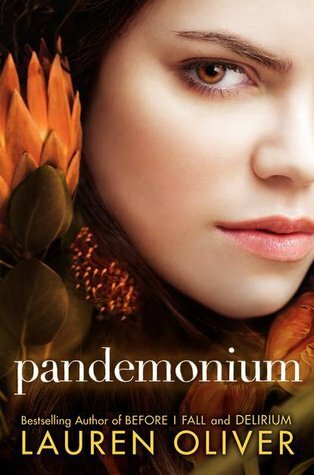 I’m still gonna give PANDEMONIUM a shot. Would you say it was better than the first? It is a faster paced, I agree there. I think I liked the first better, but I tend to always like the first book best, so that may just be me. BEFORE I FALL is on my TBR list. If I enjoy this, I might have to check this series out. I LOVE dystopia and didn’t know about this series so thanks for sharing. I have that on my shelf just waiting for me. I’m a bit apprehensive, though, because I really liked how Delerium ended. I’m worried it’ll become less powerful of an ending now that there’s a sequel. I was worried about that too, but I really like how this book continued the story. Wow, I’d forgotten this was coming out now! I have to read this soon. You have an awesome blog here, so I’m awarding you the Versatile Blogger Award 🙂 . Details are on my blog. Yeah, I kind of called the last page of PANDEMONIUM as well. On the plus side, I did not call the last page of DELIRIUM. 2013 – get here soon!